They're lush. They're dramatic. They're emotionally evocative. Nothing sets the mood like well-done ensemble strings in the hands of a skilled composer/arranger/producer. The key, of course, is "well-done," and you're sunk before you start if your strings sound like screechy steel cables instead of a rich, silky, expressive string ensemble. We'll never let that happen to you. That was our mindset when we created Orchestral Companion Strings. The SONiVOX design team has produced over 90 outstanding string programs, each one meticulously crafted to deliver as accurate and convincing an experience as possible. Your productions deserve nothing less. There is a comprehensive collection of full orchestral string ensembles, which are fantastic for background string parts or quickly sketching out an orchestral score. But we also offer you also a full array of individual string sections so you can really customize and polish your final creation by building things up section by section. The key is flexibility—you can compose and create on as detailed a level as you'd like. All sections are fully represented, including 1st violins, 2nd violins, violas, cellos and contra basses. Up and down bow bowing, sustain, staccato, and spiccato notes, plus instrument pizzicato and tremolo articulations provide the depth of content needed for convincing ensemble string parts and tracks. We spared no effort or expense in seeking out the best musicians playing the best-sounding instruments, and we took the necessary steps to record them correctly in the most lifelike manner possible. We paid attention to every detail—we left no stone unturned, as they say. All because we knew you wouldn't accept shrill, grating, artificial-sounding strings any more than you'd put up with some cheap product knock-off from a shady street vendor. We recorded the Orchestral Companion Strings in the legendary Futura Productions studios in Massachusetts. Members of the Boston Pops and/or Boston Ballet Orchestras played all performances, with the same premium instruments they use for their actual concert galas and events. A combination of spot and ambient mic’ing capture every instrumental nuance, while preserving the refined acoustics and intimacy of the performance space itself. We expended more effort and care on this system than most audiophiles do on their own systems, but that's how important it was to us...because we know that's how important it is to you. 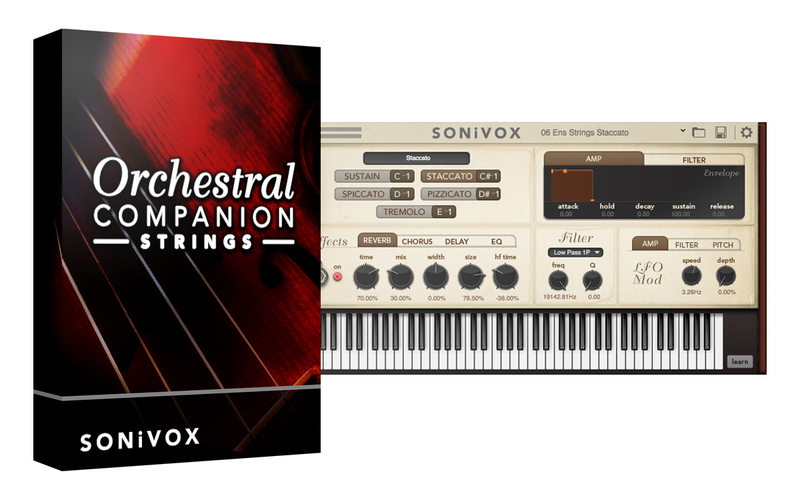 In addition, Orchestral Companion Strings runs as a fully compatible plug-in with any VST (32 or 64 bit), AU (64 bit) , and AAX (32 or 64 bit) for ProTools 10.3 or higher Digital Audio Workstation (DAW) software.